A delegation of journalists visited the middle and primary school in village Lal bux notkani union council of lanwari sharif district Badin on account of the strong protest of villagers and huge number of students in front before the press club Seernai. The village is thickly populated having above 300 school going age children are deprived of their basic rights to education due the ruined schools buildings. Many times students got injuries while getting education. A series of natural disasters left 2 school buildings of primary and secondary in village lal bux notkani ruined in union council of Lanwanri Sharif district Badin. Both of school buildings were not repaired since the construction in 1994. Owing to continual climatic hits, the buildings are no longer safe for education to be continued, therefore; the buildings must be repaired so that the hundreds of students could continue their education. Representatives of Institute for Social and Policy Sciences have started conducted meeting with different MPAs of their areas for the development and promotion of education, particularly of primary education in taluka Meer Pur Bathero, district Thatta. In this regard, district Coordinator Alif Ailaan Mr Mukhtiar Lai Zaur and other met with MPAs including Ms Her Soho, Mr Amer Hyder Shah Sherazi and Ms Rehana Laghari for discussing on the promotion of education in the district and for the implementation of article 25 A of the constitution of the Pakistan. Government Primary boys school Sachal Sarki is closed since last 10 years. Children of the village are not able to exercise their right to education. 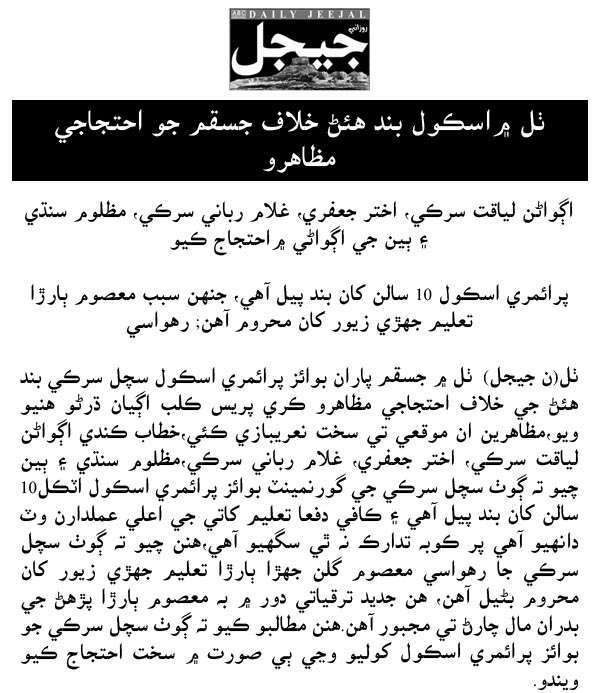 Nationalist political party JSQM organized demonstration and demanded from the Sindh government to immediately open the school so that children could get their education. Representatives further said, they have complained to authorities, many times, but, no one is responding yet. Due to closure of school children of the village are deprived from their basic right to education. They demanded from the government of Sindh, education department to immediately open the school. Demonsration was representated by Mr Liaquat Sarki, Akhtar Jafari and Ghulam Nabi Sarki of the JSQM. I raised my children alone and worked hard to provide them with an education. That is my biggest achievement. My ideology is never to be dependent on anyone — not even on my children. A husband who provides for you and takes care of the family was a luxury Yasmin never knew since her husband never bought a penny home. Hence, she set up her own business and started selling homemade ice cream to support her children. The business grew over time and Yasmin transformed two of the rooms in her house into a production space and hired an employee to supply the ice cream to stores across the city. After 15 years, however, the business had to be shut down in 2006 due to rising costs and worn-out machinery. High School Management Committee and School Management Committee organized program to highlight the importance of education in the Faka High School near Khudaabad. Program was chaired by Director Education Mr Syed Rasool Bux Shah who delivered speech and sensitized parents to send their children to school and we would fill our all responsibilities to provide required facilities to the school. Experts including scientists, educationists and researchers have sought for an updated educational policy for Sindh as well as for other provinces of the country. Speaking at the inaugural session of a hands-on training workshop, “Application of “reverse phase high performance liquid chromatography (RP-HPLC) for the evaluation of anti-inflammatory drugs,” organised by Dow University of Health Sciences on Thursday. They said the envisaged policy must be focused on enhancing capacities of students at every level. It was also suggested that the policy for each of the province must be in accordance to the needs of the modern day technology-oriented world without any compromise to the religious values of the masses. 7500 teachers are helpless to get justice as Government is not paying to them saying their contract are not legal. These teachers are working from about two years in different Schools. Punjab Chief Minister Shahbaz Sharif has said that implementation of Punjab School Reforms Roadmap has substantially improved education sector in the province. He was presiding over a high level meeting to review Punjab School Reforms Roadmap, here on Friday. International educationist Sir Michael Barber gave a detailed briefing regarding Punjab School Reforms Roadmap. The chief minister said that the target of enrolment of four million children in schools would be achieved by October. He said that in order to promote quality education, one lakh 40 thousand teachers were recruited on merit in Punjab last year. Shahbaz Sharif said that the Punjab government was spending billions of rupees for the promotion of quality education in the province. He said that data collection process was being digitalized for making school reforms programme more effective. Planning and Budget Deputy Secretary at the School Education Department Qaiser Rasheed has said that 23,000 new classrooms will be constructed in public schools of 16 districts of Punjab during the next three years. Speaking at an event related to upcoming survey of Annual Status of Education Report (ASER) on Saturday, he said DFID would provide a funding of £105 million for the purpose. ASER Director Programmes Baela Raza Jamil and other educationists were also present on the occasion. Qaiser Rasheed also said the Punjab government was opening 500 schools on public private partnership in 24 districts, adding that 21,000 schoolteachers would also be recruited to meet the shortage of teachers at government schools. Buildings of 125 government-run schools in Rawalpindi district have been declared partially dangerous, posing threats to the lives of thousands of students. According to a survey conducted by Rawalpindi’s education department, building of 125 schools have been found unsuitable due to the dilapidated condition of the classrooms. Meanwhile, all classrooms of Government Primary School Dhoke Hashoo Gujar Khan and Primary School Paswal Taxila have been declared dangerous. A source, who was part of the survey team, said there were 38 school buildings in Rawalpindi city, eight in Taxila, 16 in Murree, 16 in Kotli Sattian, six in Kahuta and 40 in Gujar Khan, which have been declared dangerous. He said schools in question have a number of classrooms and a few of them are dangerous. The Capital Administration and Development Division on Thursday wrote a letter to the chief commissioner of Islamabad Capital Territory and the Ministry of Interior to get all the schools and colleges vacated from security officials. Currently, about 59 schools and colleges are being occupied by police personnel of the capital, Punjab and Azad Jammu Kashmir to guard the city amid the sit-ins and long marches. Initially there were about 32 educational institutes but on August 18, ICT Administration officially demanded another 27 institutes to house an additional 10,000 security personnel. CADD Additional Secretary Qaiser Majeed issued the letter to the chief commissioner and additional secretary of the interior ministry. According to the letter, the official asked them to vacate federal schools and colleges from the police and district management personnel as soon as possible so classes could commence from September 1. Swat has been considered a centre of quality education since it was a princely state long ago. The first-ever school was established in Saidu Sharif, the capital of the former state, in 1922. There followed the opening of many more schools for both boys and girls. Soon after Swat was merged with Pakistan, former prime minister Zulfikar Ali Bhutto announced the establishment of university and the board of intermediate and secondary education in the National Education Policy in 1972. Since then, the establishment of a university in Swat had been a demand of the people of Swat. Though the university was established in 2010, its campus is yet to be set up in Charbagh locality. The Capital Administration and Development Division (CADD) has announced reopening educational institutes from September 1 after city administration agreed to vacate some 32 schools where security personnel are staying. The chief commissioner of Islamabad Capital Territory informed the CADD Friday that out of 60 federal schools, 32 have been vacated from police and the rest would also be vacated as soon as possible. The Capital Administration and Development Division on Thursday had written a letter to the chief commissioner of Islamabad capital territory and the ministry of interior to get all the schools and colleges vacated from security officials to reopen them. The authorities have failed to vacate majority of the government schools in some southern districts particularly Bannu from the internally displaced persons (IDPs) causing delay in reopening of the schools after summer vacations that end today (Monday). The Education Department has yet to compile accurate data as how many schools have been occupied by the IDPs in Bannu, Lakki Marwat and Karak districts. According to an official of the Education Department, some 1,400 schools had been occupied by the displaced tribesmen at the outset of military operation in North Waziristan in the three districts. However, they gradually vacated some of those schools and currently some 460 schools were still occupied by them, he said. After extending summer breaks in Islamabad educational institutes thrice, the Capital Administration and Development Division (CADD) has finally asked the interior ministry to vacate schools and college occupied by the security officials, as educational institutes are going to reopen from September 1. Over 50 schools and colleges have been handed over to thousands of officials from Azad Jammu and Kashmir police, frontier constabulary and Rangers who arrived to guard the city ahead of the long marches of Pakistan Tehreek-e-Insaf and Pakistan Awami Tehreek. The administrations of the schools and colleges have complained about the damage done at some colleges. Although the current political crisis is not over and the sit-inners are very much there at their respective venues, yet the Capital Administration & Development Division (CADD) has taken a bold decision by announcing that schools are opening from Sept 1, Monday. The decision is hailed by all—students, teachers and parents—as the schools remained closed for extra 20 days even after availing the two-and-a-half month summer vacation. First the schools were to open on Aug 11, but since the Punjab police was residing in schools buildings and the law and order situation was not up to the mark, the CADD authorities decided to delay opening for a week. However, on Aug 18 schools could not open again due to the fragile security situation and the Punjab police jawans boarding in the school buildings. The delay lingered further from Aug 18 to Aug 25 and from Aug 25 to Sept 1. This was causing immense loss to the students regarding their studies and preparations for the upcoming term/annual exams. A number of parents and students kept calling Pakistan Observer’s offices during all the while inquiring about the date of opening. he teachers and employees of Federal Directorate of Education (FDE) have expressed displeasure over denial of their right of fee concession for up to two children studying in the schools and colleges. The Sindh senior minister for education and literacy, Nisar Ahmed Khuhro, on Friday distributed ATM cards to female students from grades six to 10 at a government school through which they would be able to obtain their monthly stipend. The education department has promised to give more than 400,000 female students monthly stipends. Those belonging to rural areas will receive Rs3,500 while those from urban areas will get Rs2,500. Students belonging to rural areas will get the amount through the Easypaisa facility due to the absence of banking networks. The Punjab Education Foundation has decided to issue vouchers to 50,000 deserving male and female students so that they could continue their study free of cost. Talking to newsmen here on Thursday, PEF Director Shafiq Ahmad said that the vouchers would be issued to the students of remote areas of Dera Ghazi Khan, Rajanpur and Muzaffargarh districts under the PEF education voucher scheme. He said that the PEF had signed a contract with 96 private schools in the districts in this regard. He said that the PEF education voucher scheme was a free school education programme, which was launched to educate the children belonging to underprivileged areas, who could not get education due to their financial and social constraints. Students are likely to miss more classes because the Capital Administration and Development Division (CADD) is considering keeping the model and federal government schools/colleges closed for another week. More than 20 federal government and model schools and colleges in Islamabad could not be opened after the summer vacations on August 11. The government had initially decided to reopen the schools on August 31. However, it is now thinking of keeping them closed until September 6. For the last 19 days, the schools have been shut to provide accommodation to thousands of police personnel called from Punjab and Azad Kashmir in the wake of the sit-ins in the city. “The first thing which I did after returning to school with my new training on critical thinking classrooms was changing the class set-up. I moved all the students’ benches aside and we spread a mat on the floor in the middle of the room on which I sat down with the children, who were thrilled to find their teacher at the same level as they,” said Sajida Parveen, who at the time was a young teacher at a school in Lyari. “My headmistress and other seniors were aghast but only until they saw a change in my students’ learning attitude. The children were suddenly more lively, more alert and didn’t hold back from asking questions while also sharing with me what they thought,” said Sajida, who is now the headmistress in the same school. One of the issues facing the education sector in Pakistan is the dysfunctional school management bodies (SMB). Comprising parents, local community members, teachers and philanthropists, the bodies oversee all administrative matters of schools including financial management and internal audit. Experts think SMBs is the solution to many issues confronting our education system. The Free and Fair Education Bill of the Punjab government provides a section for the establishment of SMBs but the law does not give any detail on the composition and role of such a body. Center for Peace and Development Initiative (CPDI) Executive Director Amir Ejaz said the establishment of the SMBs is imperative for the betterment of the education system. He said the formation of SMBs should be the responsibility of local authorities, adding that members of civil society can also be engaged in the process. There is uncertainty over whether Islamabad’s government schools and colleges will reopen after summer vacation on September 1.The reason as cited by a relevant official is that first, major roads in the city are blocked by shipping containers due to the prolonged PTI and PAT sit-ins against the PML-N government outside Parliament House and second, many school and college buildings are occupied by police and rangers called in from different parts of the country to maintain law and order in the city. There are around 520 government schools and colleges in Islamabad and almost 55 of them are being used to accommodate personnel of law-enforcement agencies. The prolonged sit-ins have led to the extension of two-month summer vacation for students of local educational institutions thrice. The Sindh High Court (SHC) on Wednesday extended its stay against shifting Sindh Muslim Science College from its relatively peaceful location to the restive neighbourhood of Lyari. The bench headed by Justice Ahmed Ali M Sheikh, directed the directors for colleges and college buildings inspection to file their comments, explaining why the college was being shifted, by September 10. The controversy arose when some college students went to the court last year against the government’s decision to shift the college building. They said that the Sindh government had merged Sindh Muslim (SM) Government Science College with Sindh Madressatul Islam, which was later given the status of a university. Once the university’s management took control of the administrative affairs of the college, it decided to shift the physical assets and staff of SM College to the building of the Government Degree Girls’ College in Kharadar. The Higher Education Commission (HEC) has invited all public and private institutions of higher education in the country to provide feedback on the revised criteria for the ranking of universities. The HEC has also conducted a thorough review of the ranking process to enhance transparency in the future rankings of universities. The ranking provides one of the mechanisms for the assessment of quality of teaching and research in the country and ensure the enhancement of quality of higher education through healthy competition among the universities. The ranking criteria have been developed keeping in view the needs of higher education in Pakistan and are based on several factors including adherence to quality assurance criteria in the appointment of faculty members, faculty development, student intake, quality of MS/MPhil and PhD programmes, graduates produced, implementation of plagiarism policy, research projects, research publications, quality of research journals, national and international awards, conferences organized and academia-industry linkages. Students of Government Degree College Landi Kotal staged a protest demonstration on Thursday against lack of facilities in the college. The protest was organized under the auspices of college students union and hundreds of the students took part in it. They were holding banner and placards inscribed with slogans in favour of their demands and were chanting slogans against college administration and political administration of Khyber Agency. Addressing on the occasion Aman Ali and Waqar Shinwari, who were leading the protest, said since long the college has become hub of problems and unfortunately the authorities concerned are not interested to address it. They said due to insufficient seats in the college more than four hundred students have deprived of admission which is step injustice to the tribal students. Since long the college hostels have been closed for unknown reasons and students of remote areas face miseries as their time wastes in travelling, they opined. They asked for immediate opening of the hostels. The college is lacking basic facilities like electricity and provision of potable water, adding the students are compelled to drink polluted water that has caused spread of stomach disease among the students, Waqar argued. The Higher Education Commission (HEC) of Pakistan, in collaboration with the Islamic Educational, Scientific and Cultural Organisation (Isesco), has organised a two-day ‘Third Meeting of Country Coordinators for Establishment of Pan-Islamic Research and Education Network (PIREN)’. Besides participants from Pakistan, six persons from the Islamic countries and two participants from ISESCO have come to attend the two-day session. HEC Chairman Dr. Mukhtar Ahmed was the chief guest on the occasion. In 2012, ISESCO planned to establish the Pan-Islamic Research and Education Network (PIREN) among the member states. The main objective of PIREN is to connect local research and education networks of Islamic countries to enhance exchange and cooperation between researchers and education communities by promoting use of PIREN and its applications. The Ministry of Capital Administration and Development (CAD) has announced to open all federal government educational institutions in Islamabad from Monday (September 1) but safety of students and their safely reaching schools and colleges is still a question to be answered. The educational institutions were to be opened on August 11 but the summer vacation were extended thrice, each time for one week owing to occupation of over 60 schools and colleges by police and other civil security forces which had been brought from other cities and Azad Kashmir as a part of security arrangements in Islamabad due to sit-ins of the two protesting parties. Learning online, at schools and at homes, should be properly integrated and blended by educationists to create a perfect knowledge bucket for students. This was the theme of a Love Learning Conference 2014 in the provincial metropolis here Sunday. Prominent educationists participated in the conference and shared their views about learning at every age. The conference comprised a series of lectures and workshops aimed at challenging teachers and educators to look differently and creatively at teaching and learning. The participants focused on teaching ethics, learning dispositions and integration of technology in the regular teaching and learning process through online education in schools as well as for parents who can also learn from their homes. Grave financial irregularities, undue favouritism, misuse of official authority and corruption to the tune of billions of rupees have surfaced in the Punjab government’s laptop scheme launched in their previous term, Pakistan Today has learnt. The Punjab government distributed 110,000 laptops to university students across the province allegedly to counter the rising popularity of Pakistan Tehreek-e-Insaf (PTI) Chairman Imran Khan among the youth just one year before the 2013 General Elections. However, a special audit conducted by the government’s own wing – the Auditor General’s Office – pointed out serious corruption in the scheme. The laptop distribution scheme was themed as, “Advancement of information technology amongst students through provision of laptop computers,” for the year 2011-12. Education dept spokesman clarifies govt’s position on news item citing irregularities worth billions of rupees in Punjab Chief Minister Shahbaz Sharif’s laptop scheme prior to 2013 general polls. A spokesman of Punjab Education Department, while clarifying the news item published in daily Pakistan Today captioned “Audit reveals mega scam in PML-N laptop scheme” has said that a development scheme titled “Advancement of Information Technology amongst students through provision of laptop computers” with an allocation of Rs 2 billion was included in ADP 2011-12 of School Education Department to create IT enablement amongst talented students of Punjab. The news report sets out a series of meetings held in P&D to discuss modalities, criterion and distribution of 100,000 laptops. The spokesman clarifies that it was decided that the notebook is the best option to fulfil the students’ requirements. When they saw children rush to sell flowers and offer to wipe car windshields on the streets of Pakistan, several businessmen in Pakistan were struck by an idea: these children – and there were millions like them – should be in school. They also discovered that there were large open pieces of land within Karachi that was home to many people, but which had no nearby schools. They decided that they had to intervene in public education and use their managerial expertise to create a system that works and is sustainable. So using their own money, these business leaders founded The Citizens Foundation (TCF) in 1995 and built 5 schools. “Our motto was to get the children off the street and into schools. Our principal target was to go to areas where there is no government schooling,” TCF director Ateed Riaz said at a discussion with Philippine businessmen and journalists organized by Phinma Education on Thursday, August 28. Pakistan has moved 16 notches, from number 43 to 27, in the rank given by Scimago, an independent research organisation and an international evaluation and ranking platform which analyses scientific outputs of institutions and countries and monitors over 30,000 journals and is considered one of the most credible databases in the world of research. The output of research in Pakistan moving up 16 notches, which is the second highest increase worldwide, is primarily due to the innovative higher education policies and reforms undertaken by the government of Pakistan through HEC. Higher Education Commission (HEC) has allocated Rs2.507 billion for different programmes of public sector universities for research purpose over the past five years. The Departmental Selection Board has denied due promotion to a dozen or so senior teachers of federal government model colleges. The board met lately with the Capital Administration and Development Division secretary in the chair. Sources at the Federal Directorate of Education, which oversees Islamabad government colleges, told ‘The News’ on Saturday that the board had turned down the cases of promotion of 10 assistant professors, including seven women, from BPS-18 to BPS-19 for being incomplete. They said promotion of Dr. Khalid Hanif, Inam Ellahi, Sadia Ashraf, Afifa Aamir, Shahida Parveen, Firdous Umar, Shahnaz Javed, Taskeen Saeed, Dr. Akhter Sangi and Itrat Rab was long overdue. Government College University’s student body has swelled from 6,200 students three years ago to more than 11,500 this year, Vice Chancellor Prof Dr Muhammad Khaleequr Rahman said on Friday. He was addressing the inauguration ceremony of a two-storey building for the university’s examination branch. The new building has state-of-the-art examination rooms, offices, class rooms and seminar rooms. The vice chancellor said the university had initiated more than 26 new postgraduate programmes including three doctoral programmes since July 2011. He said they were also concentrating on developing the university’s infrastructure and providing adequate facilities to students and faculty. He said they were also establishing reading rooms in all departments of GCU for students. Federal Minister for Planning, Development and Reforms Ahsan Iqbal has directed the Higher Education Commission (HEC) to launch Federal Women’s University in the capital in September. The federal minister issued these and many other directives to accelerate work on projects approved in the last budget in a review meeting for the establishment of Federal Women’s University, National Skills University and Seerat Chairs in universities across Pakistan held at HEC head office on Saturday. Federal Minister for Planning Development and Reforms Ahsan Iqbal chaired the meeting. Minister for Federal Education and Training Baleegh-Ur-Rahman and HEC Chairman Professor Dr. Mukhtar Ahmed were present on the occasion. The government has approved the establishment of Cholistan University of Veterinary and Animal Sciences at Bahawalpur. University of Veterinary and Animal Sciences Lahore Vice-Chancellor Prof Dr Talat Naseer Pasha, the focal person for the Bahawalpur project, said that the project proposal (PC-I) amounting to Rs2.395 billion had been approved by the Provincial Development Working Party (PDWP). He said that the government had allocated 1,000 acres of land in Bahawalpur for the new university. “The university is being established in collaboration with two Turkish universities: Selcuk University and Ankara University,” Pasha said. “The new university will have three faculties: bio-sciences, veterinary sciences and animal production and technology. It will have 18 departments and an institute of continuing education and extension.